Today every business is an e-business, and whether you are selling golf outings over the Internet or manufacturing the carts, there is no escaping the fact that every aspect of organizational design is profoundly affected by the new rules of the electronic economy. What many people and organizations overlook, however, is the degree to which these new rules are requiring a fundamentally different style of leadership. In E-Leader , Robert Hargrove identifies the new mindset and skills that leaders must develop in order to thrive in a world where wealth is built on relationships and experiences, not products or even technology. 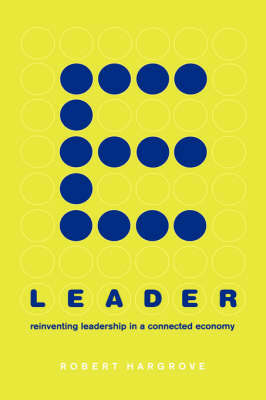 The old model of leader as "steward," protecting the company's brands and assets, is being replaced by a model of leader as "entrepreneur," searching constantly for new sources of wealth creation establishing creative ventures with suppliers, distributors, and even competitors and discovering new ways to attract, retain, and nurture talent- all at the speed of light. E-Leader captures the energy of the mavericks who are redefining leadership on the electronic frontier and shows managers in all types of organizations how to manage for the future, not for the past or even the present.